Do men really want to get married? Editor's note: Alex Wellen's debut novel, "Lovesick," follows a young man on his quest to get married and defeat a crime ring of geriatric gangsters. Wellen is an award-winning producer for CNN. For this article, he interviewed men on how they approached marriage. 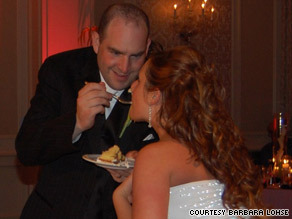 Brian Lohse feeds his wife, Alana, cake at their wedding in June. (CNN) -- "Well, what do you think?" his dad asked. Brian Lohse knew exactly what his father was getting at. His father had never pressed him about marriage before. But the question had its intended effect: a light switch flipped on. "I'd never really thought about it. But that was the point right there when I said to myself: 'Oh my gosh, you know what, this is the girl I'm going to marry,' " Brian said. "I can't picture myself spending the rest of my life with any other person than Alana." Brian, 34, had indeed made the psychological leap. It was time to get this party started. Six months later, he proposed. They married in June. If you believe the conventional wisdom, Brian's story is the exception. Somewhere along the way, marriage and masculinity became mutually exclusive. But that stands in stark contrast to the dozens of men I spoke with, who admitted -- no, insisted -- they've fantasized about popping the question, getting married, even having a wedding. The circumstances surrounding those light-switch moments varied. For one man who lost his father, it was the extraordinary outpouring of love and support from his future bride that changed everything; another guy came to the realization when he caught himself balling up his fists in anger the moment someone made a pass at his then-girlfriend; yet another described the emotion of seeing his long-distance girlfriend for the first time after spending months cooped up in a nuclear submarine. For me, the light bulb popped on at a penny arcade, playing classic '80s arcade games with my girlfriend. Kris destroyed asteroids and hopped barrels with impressive dexterity. "If you can't afford the ring, you shouldn't be moving toward the wedding right now," said Tyler Harris, 24. It took him seven years to get the ring. The Virginia couple will marry next May. As a lead underwriter for a bank card processor, Tyler is in the business of assessing risk. Not that Heather was ever a gamble. For Tyler, once they had jobs and an established income, only then could he give Heather everything she deserved. "It was an 'aha' moment that this thing I wanted to do for so many years, I could actually make it happen. So I did," Tyler laughed. He titled the wish list "Future Wife Qualities," and Craig Wilson, 47, of Portland, Oregon, composed it fresh off a failed marriage of 14 years. Among the 12 desired traits, he wrote: "Glows with happiness and a great sense of humor." Craig wasn't sure he'd ever marry again, but if he did, he had this list. With six kids and only two miles between them, Craig and Tracy should have crossed paths, but it would take a pregnant, matchmaking local first-grade teacher to bring them together. Neonatal nurse Tracy provided the teacher with tips on newborns, and Molly tipped Tracy off to a newly available bachelor named Craig. "This was the person of my dreams," Craig said. "I remember after dating Tracy into the second or third month, I went back and looked at this thing I'd written, and thought: 'Wow, she hits everything.' "
Craig proposed two months later. Tracy and Craig married last July. "She essentially hated me," recalled Rabin Nabizadeh, 35, of his new bride. I can hear his newborn cooing in the background. "I never stopped loving her." The couple dated as students in law school, but then Deepti had to leave. "We had a very difficult time at the whole dating thing," Rabin said, looking back. "I had a pretty debilitating drug addiction." Rabin said he's been sober since the day she left in 2003. Three years went by before a chance encounter brought them face-to-face again. The couple wed last February. Rabin describes the driving force that prompted him to start engagement ring shopping as "a spiritual experience of the educational variety." Read excerpt from Wellen's novel "Lovesick"
"'Whatever the difficulties are, eventually if I don't take this step, she'll just leave,' " he recalled. "It wasn't a big thunderous sense of love that got me. It was more like: 'I know I love this woman, she is my equal, and it's time.' "
"I always knew that I wanted to spend my life with Melanie. Once we got really serious, I knew we were a good team," said Chris Parks, 28. "I wanted to make that serious commitment, and I wanted her to make that commitment to me." The two met at CNN. A year later, they moved in together and started talking about buying a house. Marriage was an eventuality, but the couple was in no rush. Then came "The Talk." But not some heart-to-heart ultimatum. In fact, it was a series of talks that flipped the switch for Chris. "There were a couple of times where we went to dinner, just sitting there, talking to her, just the way we were conversing with one another, and we were talking about our futures: 'I want to do this with our lives, or that with our lives. Can you picture us when we have a house, kids, a dog?' That really resonated with me. She wasn't just thinking about herself. She was thinking about us," Chris said. "I liked the thought of that. What am I really waiting for?" he reflected. "I felt like I was a part of something." Calling all couples: When did the light bulb go off in your head? Send your pictures and video to iReport.com. Then submit your story to the "Lovesick" Survival Kit giveaway on Facebook.